A modern events center in Auckland featuring architecture inspired by the shape of a waka – a Maori canoe – was an apt venue for a gathering of nearly 1,700 Baha'is from 10 countries and island groups in the Pacific. 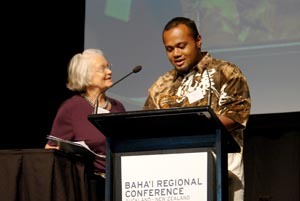 The Universal House of Justice invited Baha'is from New Zealand, the Cook Islands, Fiji, Hawaii, Kiribati, New Caledonia and the Loyalty Islands, Samoa, Tonga, Tuvalu, and Vanuatu to the conference held in Auckland’s Manukau City. Joining them for this landmark gathering were visitors from Australia, North America, the Philippines, United Kingdom and Chile. 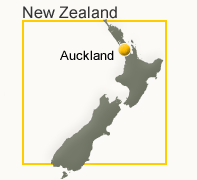 New Zealand's strong Pacific flavor, and significant and growing Pasifika population, are particularly evident in Auckland, which has the largest Polynesian population of any city in the world. 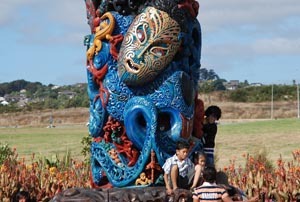 The scene was set on the eve of the official opening when representatives from the local Manurewa Marae offered, on behalf of the Tainui tribe, a formal Maori powhiri – a welcome – on the sacred grounds of their marae/meeting place. 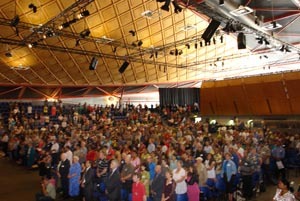 Karakia (prayers) were said for the success of the conference. 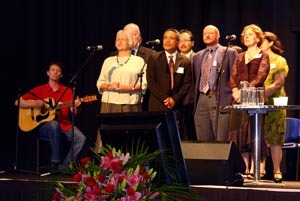 The conference opened with a stirring devotional program. Photographs of the Baha’i World Centre provided a beautiful background and enhanced the charged atmosphere in the main hall where hundreds had gathered. Among the prayers was a moving rendition of E Otua – O God Guide Me – in Tongan, offered by the colorfully adorned Manukau Baha’i Choir. Afterwards, the secretary of the National Spiritual Assembly of the Baha’is of New Zealand, extended a warm welcome to participants. Attending as representatives of the Universal House of Justice were Mr. Stephen Hall and Mrs. Zenaida Ramirez, both of whom are members of the International Teaching Center. Also present were six members of the Continental Board of Counselors, including Beatrice Benson, Soheyla Bolouri, Henry Tamashiro, Robin White, Alan Wilcox, and Firaydoun Yazdani. The reading of a special conference message from the House of Justice preceded the opening address by Mr. Hall, who was greeted by a standing ovation. Mr. Hall stated that at this critical juncture, marking the midpoint of the Five Year Plan, Baha’is were encouraged to celebrate their achievements and urged to intensify their efforts. Planning is crucial, he said, if 1,500 intensive programs of growth, a goal set by the Universal House of Justice, are to be established. He remarked on the unparalleled response worldwide to the regional conferences and praised the outstanding attendance of the Baha’is of the Pacific. 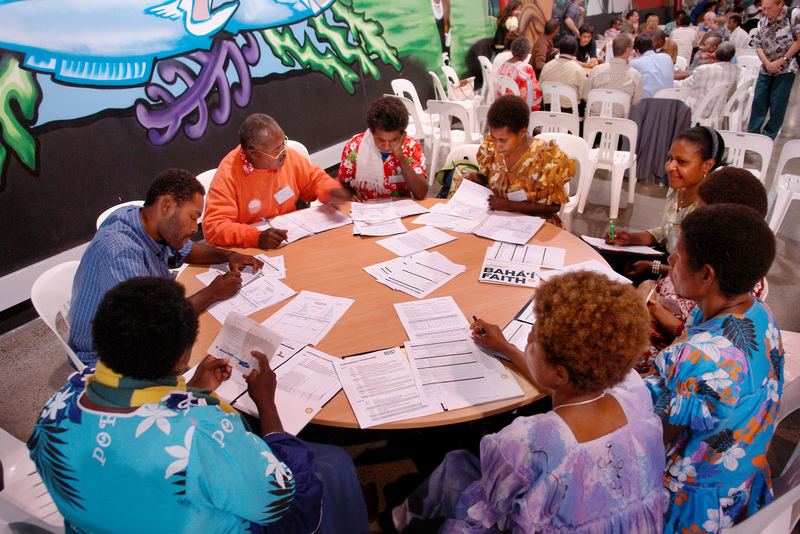 National and regional overviews of progress to date came from Vanuatu, the Cook Islands, Fiji, Hawaii and French Polynesia, Kiribati, New Caledonia, Samoa, Tonga, Tuvalu and New Zealand, with each country outlining its particular strengths, successes and challenges. 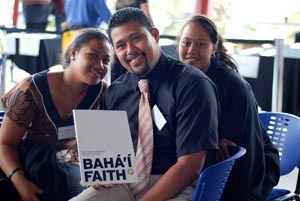 Vanuatu, for example, reported a dramatic increase in the number of people joining the Baha’i community. Fiji’s strength lay in its devotional meetings, while the small atoll nation of Kiribati reported the progress of their junior youth program. Participants then broke into workshops to study the 20 October 2008 message from the Universal House of Justice and the message to the Auckland conference. Welcomed to the stage by a standing ovation, Mrs. Ramirez elucidated the central concepts of the Five Year Plan, clarifying some of the fundamental aspects and noting that the chief motivator for action is understanding. “The hope of the Universal House of Justice for the conference is that we, one and all, be enabled to translate what we deliberate and plan into the realm of action,” she said. 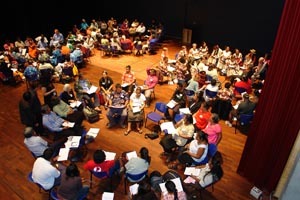 Interspersed with her comments were stories shared from participants from various countries including French Polynesia, Fiji, Tonga, Kiribati, Vanuatu, New Zealand, and Noumea. 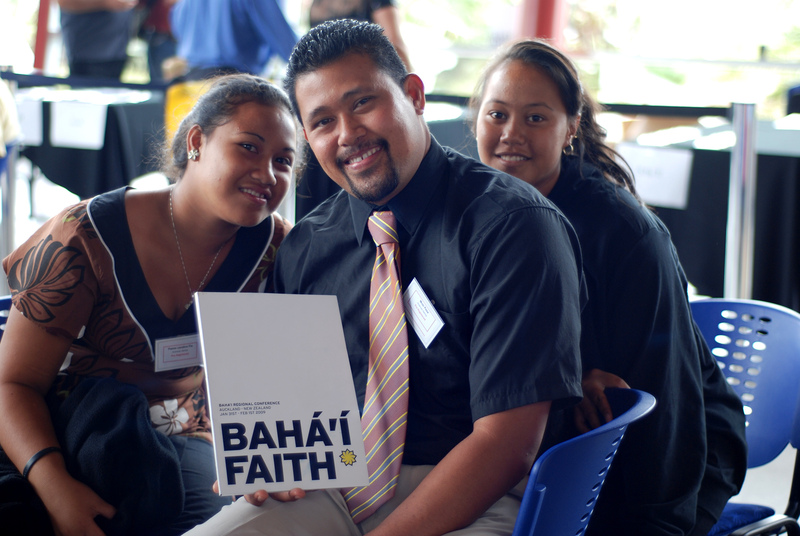 One touching story was of a Tongan youth named Mercy (born 16 years ago in the Baha’i month of Rahmat, which means “mercy”) who has been active in the establishment of junior youth programs and study circles. Other highlights included an account of recent joyful and productive reflection meetings in New Caledonia that led the Baha’is to schedule for 14 February the launch of an intensive program of growth; experiences, and lessons learned, from a recent teaching project in Auckland; and the story of a young person in Vanuatu who moved to a new area to assist with core activities and other work, helping to prepare the community for an intensive program of growth. 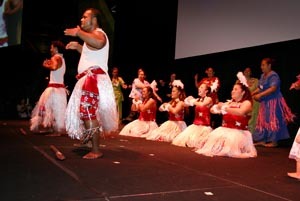 For the cultural program on Saturday evening, artists from throughout the Pacific region performed to a packed house of 2,000 people, including many guests. The exhilarating beat of Polynesian drums electrified the atmosphere and set the tone. The audience was treated to video and photographs of the artists’ home countries, as well as a slide presentation showing photographs of Baha’is around the world engaged in core activities. Believers from New Caledonia and the Loyalty Islands ended their performance by presenting a banner from their junior youth prepared specifically for the conference. The Samoan participants’ contribution was a tribute to the late Malietoa Tanumafili II depicting their former head of state with the late Dr. Ugo Giachery, a Baha’i who was appointed to the station of Hand of the Cause of God. The Manukau Baha’i Choir began its performance with a powerful rendition of Baha’u’llah’s stirring words to the martyr Mirza Abdul Vahab-i-Shirazi. Youth groups Da Lynx and Global Soul were a hit with their respective dance and vocal presentations. Members of a study circle performed a dance inspired by the youthful Badi, a well-known Baha’i martyr, while the emotion and vibrancy of singer/songwriter Grant Hindin Miller further uplifted spirits. “The Saturday evening celebration was characterized by boundless energy and infectious enthusiasm – a great spirit that permeated the atmosphere of the gathering until the end of the conference,” one participant wrote afterwards. On Sunday morning, Mrs. Bolouri, one of the counselors, spoke on the needs of the Pacific region, stating that the Baha’is should take stock of their strengths, have a clear vision and an ever-strong resolve. People were urged to return to their home countries and share the message of Baha’u’llah, strengthen the institute process and enlarge the pool of human resources. The presentation of a magnificent bouquet of flowers was made as a token of respect for the Baha’is in Iran. Particular tribute was paid to those believers currently in prison because of their religious belief. After breaking into workshops for action planning to establish intensive programs of growth, outcomes were shared later in the day, with the plenary session led by children who had consulted during their own sessions and also made commitments. 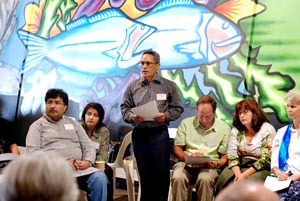 Participants made pledges to initiate or participate in one or more of the many activities of the Five Year Plan. Mr. Hall stressed the importance of acting immediately and encouraged people to return to the guidance of Universal House of Justice and re-study the messages in light of the learning from the conference. “Fire has been ignited in our hearts and we must ensure it’s not extinguished,” he said. He emphasized the need for unity in this spiritual enterprise. In his closing remarks, a member of the host spiritual assembly expressed heartfelt thanks to the two representatives of the Universal House of Justice. 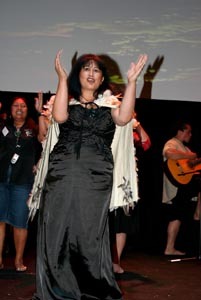 Gratitude was also paid to the Tainui people of Manurewa Marae, to conference organizers, and to the participants themselves for turning out in such large numbers and with such enthusiasm. Video: Sights and sounds from Auckland. 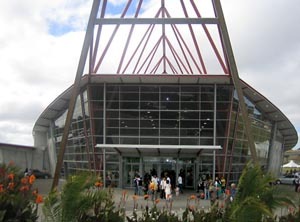 The venue, in Auckland’s Manukau City, features architecture inspired by the shape of a Maori canoe. Etienne De Wilde from Tonga tells a story about a youth named Mercy. The 1,700 participants came from New Zealand, the Cook Islands, Fiji, Hawaii, Kiribati, New Caledonia and Loyalty Islands, Samoa, Tonga, Tuvalu, and Vanuatu. 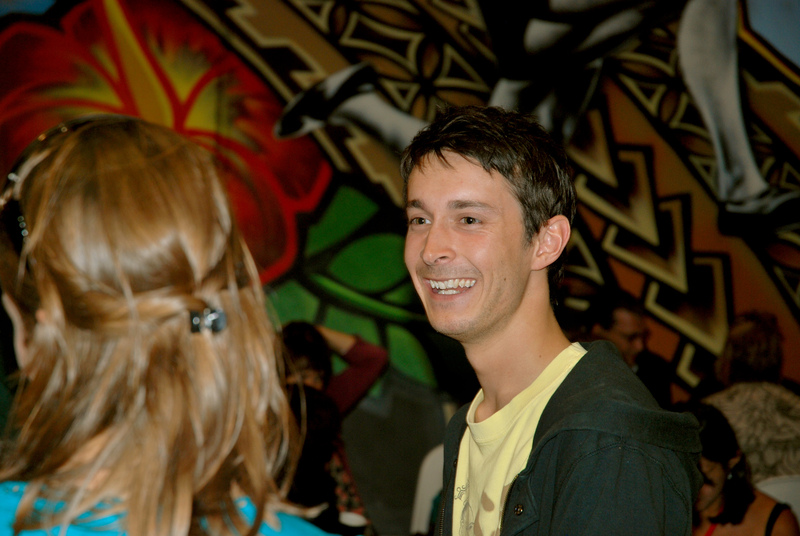 The participation of youth has been a prominent feature of all the conferences. 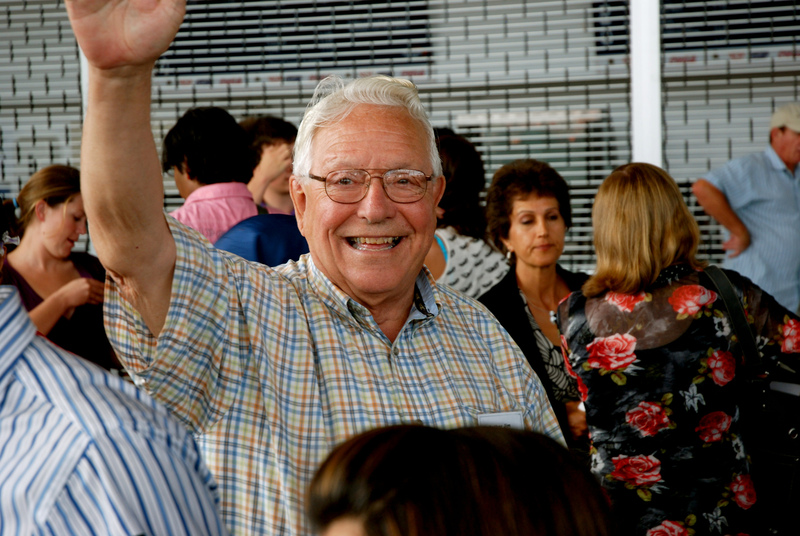 Kurt Anderson of the Auckland Baha’i community flashes a grin during one of the breaks. A dance illustrating the story of the Baha’i hero Badi is presented by Baha’is of Manukau City, New Zealand. The various groups of the Pacific islands offered performances during the cultural program. This is the Maori presentation. 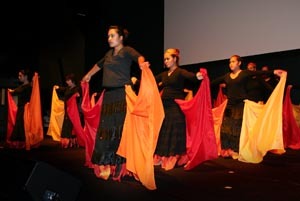 A Tongan dance is presented on Saturday evening. 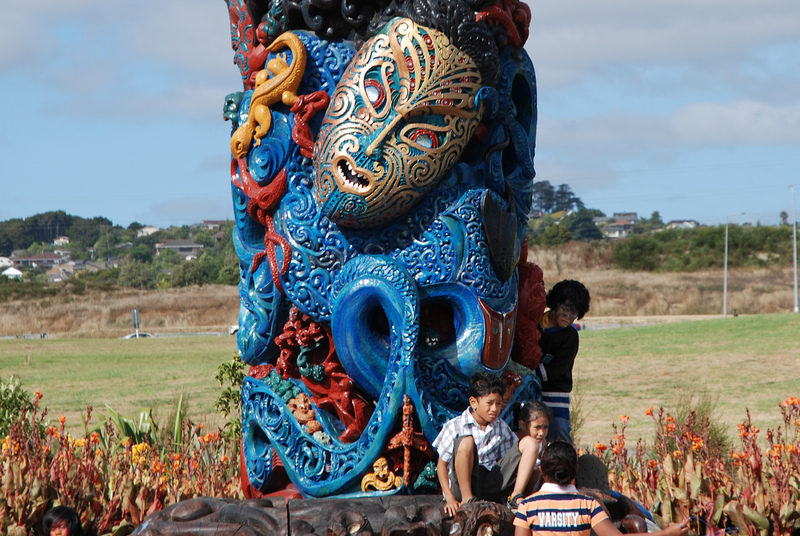 Outside the auditorium, children sit at the base of Pou Kapua Taonga, a 70-foot totem that is a gift to the world from the Maori and all New Zealanders. The conferences afford an opportunity for people to greet old friends and make new ones. 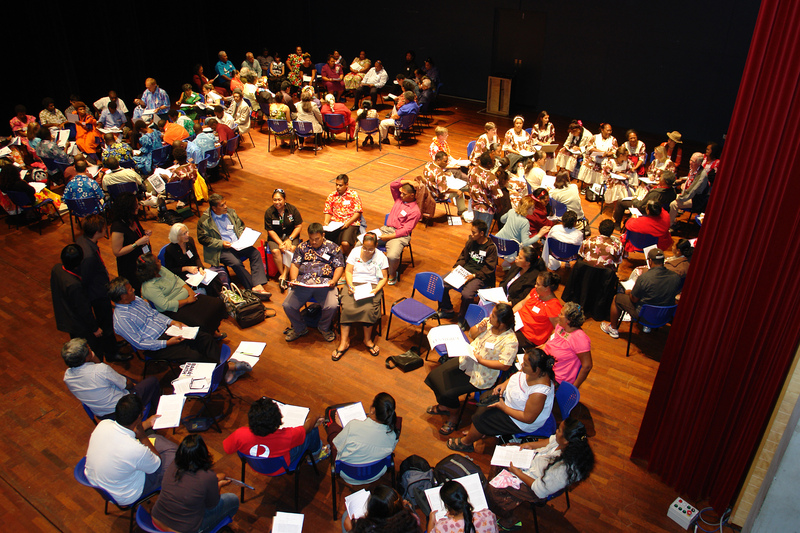 In workshop groups, people have a chance to study two messages from the Universal House of Justice, one from 20 October to the Baha’is of the world and one addressed to the Auckland conference. 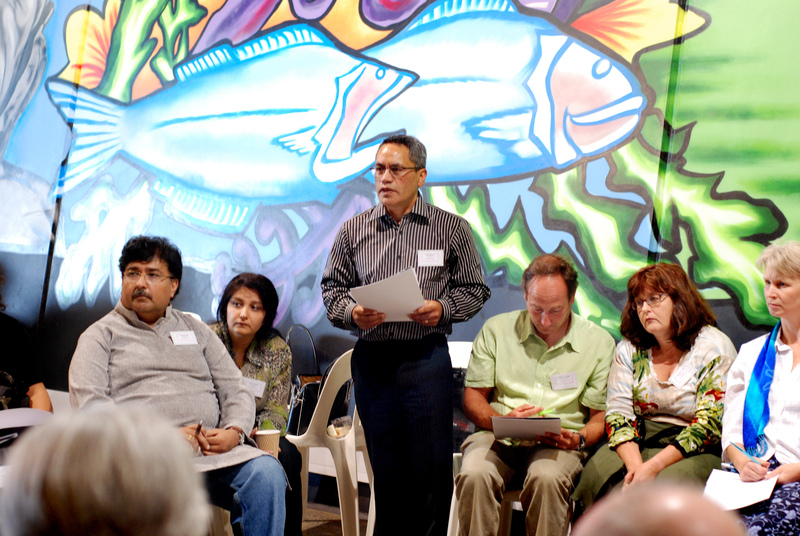 The simultaneous conferences in Auckland and Battambang were the 34th and 35th gatherings of the 41 in the current series. 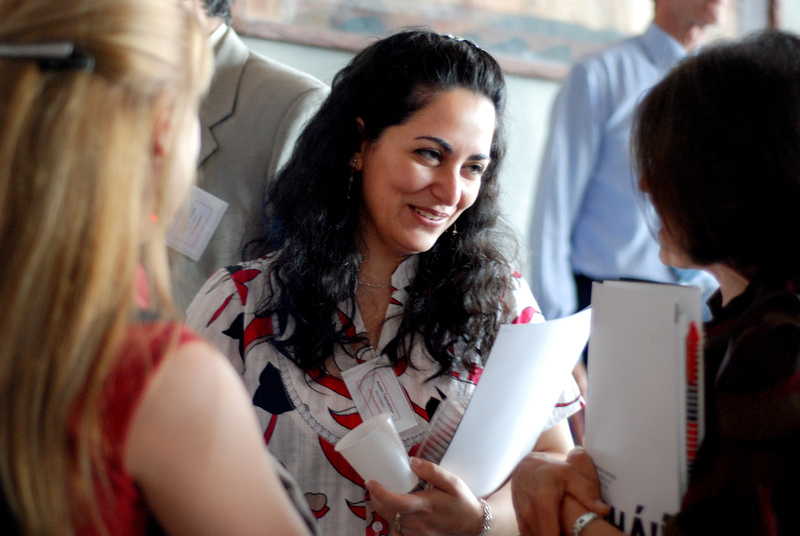 Azeen Tashakkor of the Christchurch community in New Zealand visits with other participants. The weekend of 31 January-1 February was the 14th of 18 consecutive weeks of regional Baha’i conferences. Members of the National Spiritual Assembly of New Zealand intone a prayer by ‘Abdu’l-Baha that asks that one’s endeavors be “like unto the Pacific Ocean, to reach the shores of both East and West.” Providing guitar accompaniment is Vahid Qualls.